The Minamata Convention on Mercury was adopted in Minamata and Kumamoto in October 2013 to protect human health and the environment from the adverse effects of mercury throughout the world. 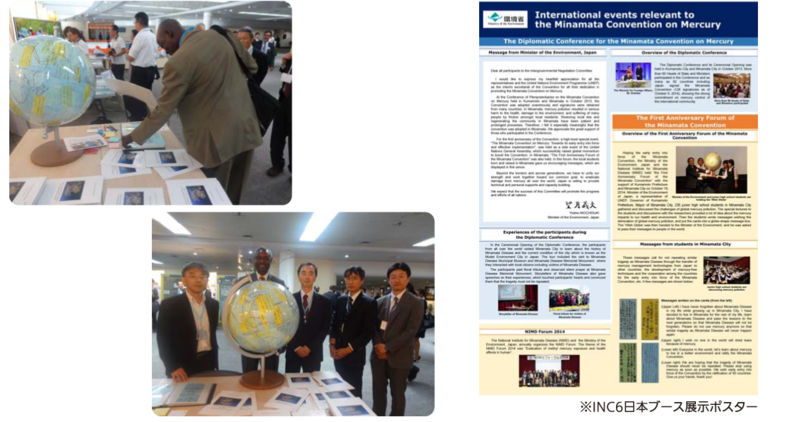 The First Anniversary Forum of the Minamata Convention was hosted by the National Institute for Minamata Disease (Ministry of the Environment), Kumamoto Prefecture and Minamata City on October 18, 2014 (Saturday) at the Institute to appeal to the world for the early entry into force of the Minamata Convention and to raise awareness of the Convention among the people living in the region affected by Minamata disease. 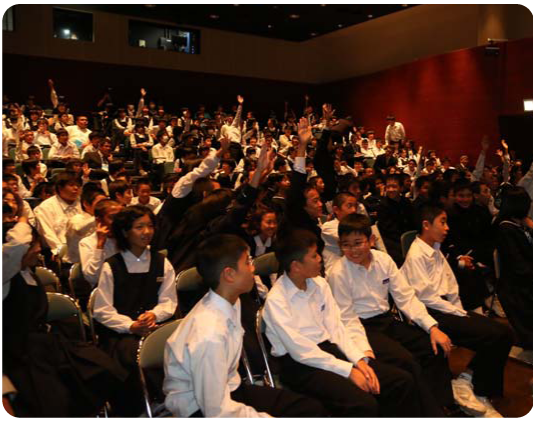 The participants included 230 first year students from four junior high schools: Minamata First, Minamata Second, Fukuro, and Ryokuto. 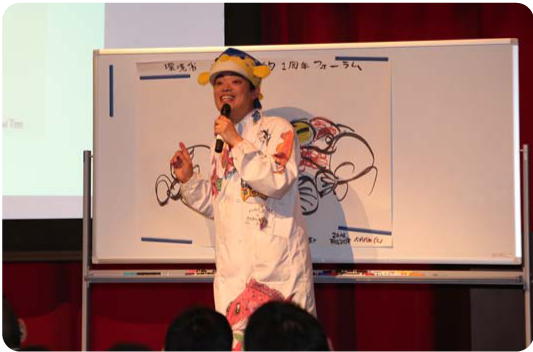 The students attended a preliminary lesson on mercury and the Minamata Convention as well as a lecture by the director of Kumamoto Eco environment center, Mr. Fujiki, and discussions with globally prominent mercury researchers, held on the day of the forum, under the theme “A message that can only come from Minamata ? Let’s link Minamata’s hopes and prayers with the future.” Responding to what they had learnt, felt and seen, each student wrote a message appealing to the world not to allow the harm of Minamata disease to be repeated, and appealing for the early entry into force of the Minamata Convention. 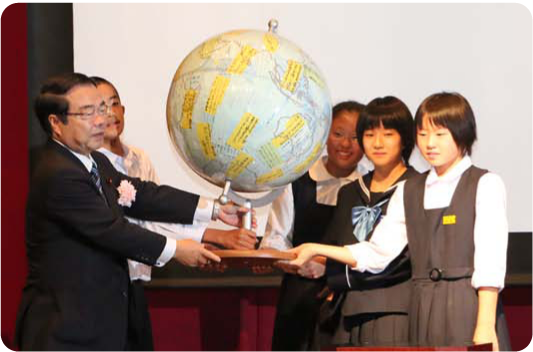 The students then put their messages inside a world globe, which they presented to the Minister of the Environment, Mr. Yoshio Mochizuki. The globe was filled with messages written by the students themselves, their viewpoints mainly reflecting the importance of the Minamata Convention, mercury pollution in the world, as well as the cause of Minamata disease, mercury itself. On receiving the globe, Minister Mochizuki replied, “Thank you for your messages of hope. I will bring this globe and what has happened at this forum to the intergovernmental negotiating committee on the Minamata Convention, which will be held in November. I will relay what you have said to the representatives of each country at the committee.” The minister had clearly taken on board the sentiment of the students attending. 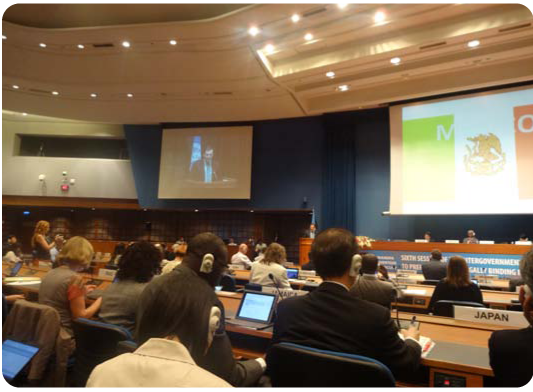 The sixth session of the intergovernmental negotiating committee on mercury (INC 6) was held from November 3 to 7, 2014, in Bangkok, Thailand, where the globe and its messages were displayed and a video of what happened at the forum was shown. Representatives from the various countries who attended were deeply impressed by the extraordinary efforts exhibited in the students’ messages, which reflected the experiences of Minamata disease and the lessons learnt. The representatives from across the world also expressed their determination to protect the world from the adverse effects of mercury. The United Nations Environment Programme (UNEP), which is promoting the Minamata Convention, also expressed respect for the students’ efforts as well as their messages, which will be a boost to early entry into force of the Minamata Convention. UNEP also indicated that it intends to take action in commendation of the students’ efforts in the near future. As of December 2014, 128 countries had signed the Minamata Convention. At the time the Minamata students kicked off their efforts, one country had ratified it, but that number has since grown to nine. The Minamata Convention will enter into effect as a global convention given the ratification of at least 50 countries. The Ministry of the Environment is therefore committed to various information dissemination measures, joining forces with the students and citizens of Minamata City as well as the people of the area affected by Minamata disease so as to raise the number of ratifying countries. “A message that can only come from Minamata ? Let’s link Minamata’s hopes and prayers with the future.” The Japanese Government ran a booth at INC6 displaying a poster with an article about the First Anniversary Forum of the Minamata Convention. Minamata Disease Archives will open a special exhibition on the first floor of the building in mid December enabling visitors to see the globe containing the students’ messages, the video, display items, the creations by students from the junior high schools at their culture festivals, and the illustrations drawn by “Sakana-kun”, who inspired the audience at the First Anniversary Forum of the Minamata Convention. We hope you see the exhibition.